As Plato famously never said: “Only the dead have seen the end of war.” The only questions for the living are when War will come, what He will look like, and what deadly accoutrements He will bring to bear this time. 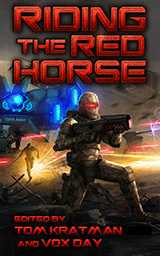 The answers, according to military sci-fi anthology tour-de-force Riding the Ride Horse, are “soon, scary, and probably lasers”. In a similar spirit as Jerry Pournelle’s There Will Be War anthology, this collection of twenty-four stories and essays is of very high quality, written with artistry and credible military know-how by men who clearly never shoot a large caliber man with a small caliber bullet. Their careers and accomplishments are as varied as they are impressive – a technologist who helped found the open software movement, a naval flight officer with 300 arrested carrier landings, a couple of leading wargame designers – there is even one gentleman who supports crucifixions and another who was purged from the SFWA. But they are authors, all, and damn good ones. The editor thinks of them as “Napoleon’s Guard: The Young Guard, the Middle Guard, and—elite among the elite—the Old Guard”. Most of them have a successful military sci-fi franchise or two (or ten) and their stories here serve as advertisements for those series. The newer authors all figure to be major players in the genre for some time and it’s a pleasure to become acquainted with their work – their speculations of 21st century warfare (and beyond) are as thought provoking as they are entertaining. Frightening, too. “Sucker Punch” by Eric S. Raymond is the latter, as it imagines an ascendant Red China invading Taiwan. When the USS Ford intervenes, they come face to face with War’s latest technological monstrosity – a Great Leap Forward that is actually a great leap forward. This story, as well as Vox Day’s “A Reliable Source” and “Within This Horizon” by Thomas Mayes, illustrate with shock and awe what the final nail in the coffin of American exceptional might look like, and if you’ve never done that before, you may just wet your huggies. For more of the pulse pounding variety, my favorites were the no-nonsense special forces techno-thriller “Thieves in the Night” by Chris Kennedy, which brings the weepy Boko Haram kidnapping hashtag #BringBackOurGirls from a sackless social media campaign into tiger blood reality, conspiracy revenge thriller “Red Space” by Giuseppe Filotto, and sci-fi standout “Turncoat” by Steve Rzasa. The last two in particular are rich in ideas, have page-turning plots, fascinating characters, and a craftsman’s prose. Overall, the authors in this collection never let the (mostly) diamond-hard nature of the sci-fi get in the way of good storytelling. The characters are three-dimensional and relatable across-the-board. On the non-fiction side, the articles and essays in the collection are as intriguing as anything one might find in a cutting-edge military or foreign-affair journal. Other topics cover everything from laser technology to the challenges of war gaming. I only have two quibbles: Tom Kratman didn’t contribute any fiction, and his article on the principles of war would have been more useful for the reader at the beginning of the collection. This is a dense anthology, and at just $5, packs quite a lot of bang for the buck. Enjoy it while you’re alive; the dead don’t read about war. Shame. I’m currently halfway through “A Desert Called Peace”, and it’s bloody marvellous. I’m about halfway through and it has, for the most part, been excellent. “Sucker Punch” and “The Hot Equations” have been the most interesting so far. “A Piece of Cake,” however, felt like a bait and switch. Homo-pilots? Not only was it repulsive, but that thread added nothing to the story. Nevertheless, I’m looking forward to the second half of the anthology. Are there currently any plans in the works for a second volume of RRH?